What is the key ingredient of every ski town? Snow. And how do they ensure they have this important element? Well, in Breckenridge, they host Ullr Fest, four days dedicated to the Norse god, stepson to that muscular god with a hammer – Thor. With great festivity and a lot of Viking horns, the hope is that Ullr will bring lots of snow to the town. The festivities kick off with the annual ski shot on Main Street. What is a ski shot you ask? Well, participants line up and down the street, alongside 422 skis which are attached end to end. All pick up the skis, place their shot glass on the ski and await their liquid prize. At the signal, everyone takes a shot. A great way to get a Norse god’s attention! Apparently, this is a fierce competition for the world record each year between Breckenridge and Park City. Congratulations to the champions – Breckenridge with 1266 people taking a shot! As we watched the fun (sadly, it was sold out so we did not get to participate), we met three gentlemen who have been attending the festival and taking their own shot for 46 years! Very devoted Breckenridge residents. They leave the ski shot up to the younger set now, preferring to bring their own flask of fun to keep them warm for the next event – the parade. Now, you can imagine the type of parade that follows a ski shot. Take Viking dress, add snow, a lot of imagination and toss out all the rules, then you will have the Ullr Parade. 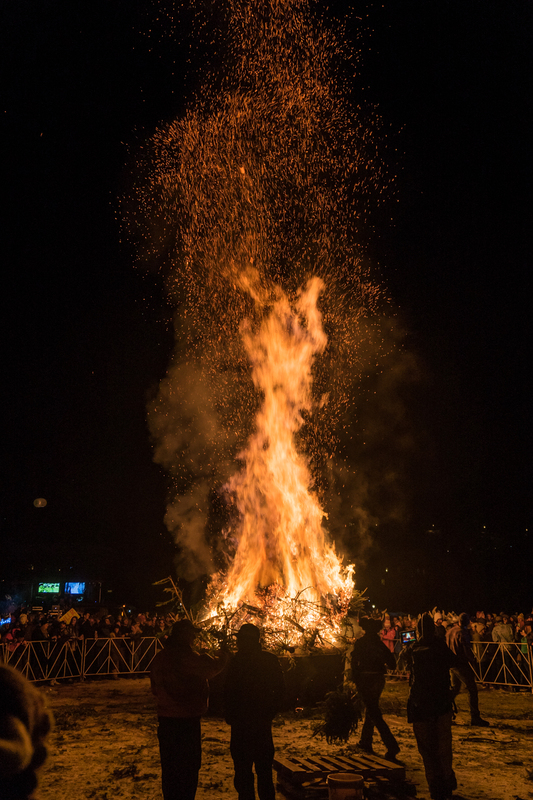 Topping off the day is the Christmas tree bonfire. Discarded Christmas trees are gathered from across the town for a large bonfire just off Main Street. As each tree is added to the pile and burned, cheers and glowing ashes arise. While we did skip the Ullr Plunge in the Blue River the next day, we enjoyed the evening’s comedy show with two Denver comics and a film festival on Saturday. After a strong four days of fun and town spirit(s), Ullr blessed Breckenridge with many inches of great powder. Thank you, Ullr!